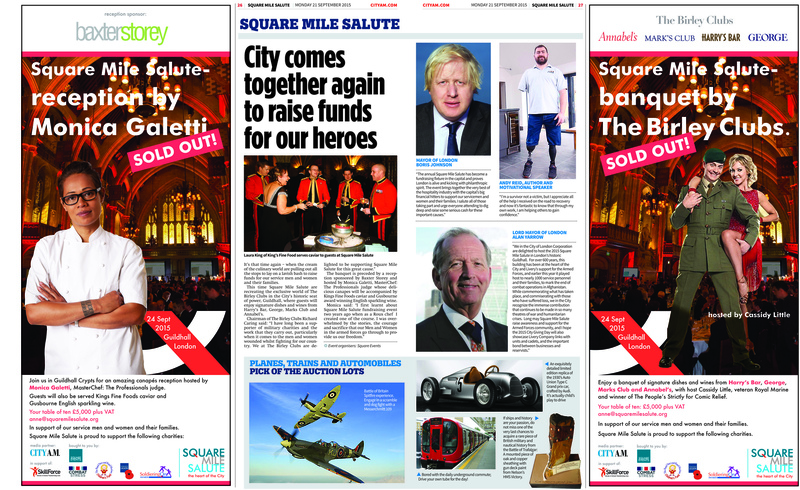 This time Square Mile Salute are re-creating the exclusive world of The Birley Clubs in the City’s historic seat of power, Guildhall, where guests will enjoy signature dishes and wines from Harry’s Bar, George, Marks Club and Annabel’s. The banquet is preceded by an amazing reception sponsored by BaxterStorey and hosted by Monica Galetti, MasterChef: The Professionals judge whose delicious canapes will be accompanied by Kings Fine Foods Caviar and Gusbourne award winning English Sparkling Wine. City guests will be joined by veterans in their 90’s including WWII Bomber Command and Ex POW veteran, Charles Clarke; Sandy Saunders, member of the of WWII The Guinea Pig Club who pioneered plastic surgery to treat pilots horrific burns wounds. – and current day veterans; demonstrating the strong bond of fellowship that exists and the need for support to continue for many years after conflict has ended.